Introduction: The LANC Shepherd Pro has all the features of the LANC Shepherd, and adds microprocessor control of an external flash, for highly synchronized photography with Sony digital cameras and an external flash unit. 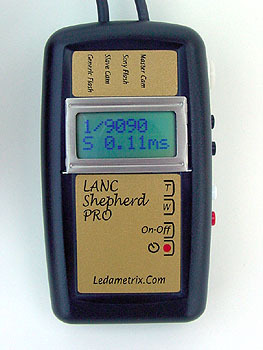 The LANC Shepherd Pro controls a pair of digital cameras, and coordinates timing for an external flash. For a detailed discussion of logic behind the microprocessor control of flash timing, see the stereo flash photography page here. The LANC Shepherd Pro also protects the cameras from the potentially damaging high trigger voltage present with some electronic flash units. Compatible Cameras: Sony Mavica MVC-CD500, and the Cybershot DSC-S75, DSC-S85, DSC-V1, DSC-V3, DSC-F717, DSC-F828, and DSC-R1 (manual zoom only on the F828 and R1). I recommend the DSC-V3 or DSC-V1 as the best combination of light weight and image quality. Where weight is not as much of a concern, I recommend the Sony DSC-R1 for astounding image quality and shutter sync. The LANC Shepherd Pro cannot be used with any other brand of digital still camera. The LANC Shepherd Pro also supports Sony and Canon video cameras with a "LANC" port (there are hundreds of models), although Canon video cameras do not support the still image capture function through the LANC port. The LANC port on many Sony consumer level camcorders is now labeled “Remote". These are identified as a 2.5mm, stereo mini, or MiniPlug "Remote Jack" in specifications (as opposed to an IR infrared "Remote Control" sensor), and labeled "Remote" on the camera. For example, the Sony DCR-SR100 hard disk camcorder, the Sony HDR-SR1 hard disk high definition camcorder, and the Sony DCR-DVD405 DVD camcorder are confirmed to work with the LANC Shepherd Pro through this "Remote" jack. Compatible Flash Units: The LANC Shepherd Pro can be used with a Sony HVL-F32X or Sony HVL-F1000 flash unit. 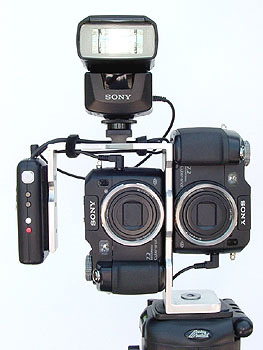 One of the two flash jacks on the LANC Shepherd Pro is dedicated to Sony flash units. I recommend the HVL-F32X as the most versatile Sony flash unit, as it supports fully automatic, TTL, and manual flash modes. The Sony HVL-F1000 is only fully automatic, but is smaller, lighter, less expensive, recharges the flash instantly, easiest to use, and works very well also. The LANC Shepherd Pro also has a second dedicated flash jack for a generic flash or flash triggering system. The jack is a 3.5mm (1/8") "miniphone" jack, and connecting cables are commonly available from photography suppliers for popular flash models (see the user manual link below). There are hundreds of generic flash units (for example Vivitar and Sunpak) and flash triggering systems (for example Pocket Wizard) that will work well with the LANC Shepherd Pro as well. The LANC Shepherd Pro provides protection (the LANC Shepherd Pro is rated to 400 volts) from the high trigger voltages found on some older flash units. User Manual: Additional information about the LANC Shepherd Pro and detailed user instructions. Ordering: The LANC Shepherd Pro is available from Berezin Stereo Photography Products. The Pictures: Here are a few sample stereo images for your enjoyment. The pairs are big, 900x600, and I need to use a screen resolution of at least 1024x768 to view them on a web page. I apologize to those of you without broadband also--the compression is mild, because I can't stand to see JPEG compression artifacts in stereo. These images all open in a new window. Optimized for screen resolution of 1024x768 or higher, 32 bit color. Crossed View Parallel View 184k. Summer sunset on the deck. Sony DSC-V3 cameras, LANC Shepherd Pro controller, Sony HVL-F32X Flash. Crossed View Parallel View 115k. Crossed View Parallel View 430k. Sony DSC-V3 cameras, polarizing filters, LANC Shepherd controller. Crossed View Parallel View 199k. Crossed View Parallel View 180k. Crossed View Parallel View 485k. Sony DSC-V1 cameras, LANC Shepherd controller with internal flash. Crossed View Parallel View 286k. Crossed View Parallel View 395k. Crossed View Parallel View 303k.